Why do we get older? When do we die and why? Is there a life without ageing? For centuries, science has been fascinated by these questions. Now researchers from Kiel (Germany) have examined why the polyp Hydra is immortal – and unexpectedly discovered a link to ageing in humans. The study carried out by Kiel University together with the University Medical Center Schleswig-Holstein (UKSH) will be published this week in the Proceedings of the National Academy of Sciences of the United States of America (PNAS). It was funded by the German Research Foundation DFG. The tiny freshwater polyp Hydra does not show any signs of ageing and is potentially immortal. There is a rather simple biological explanation for this: these animals exclusively reproduce by budding rather than by mating. A prerequisite for such vegetative-only reproduction is that each polyp contains stem cells capable of continuous proliferation. 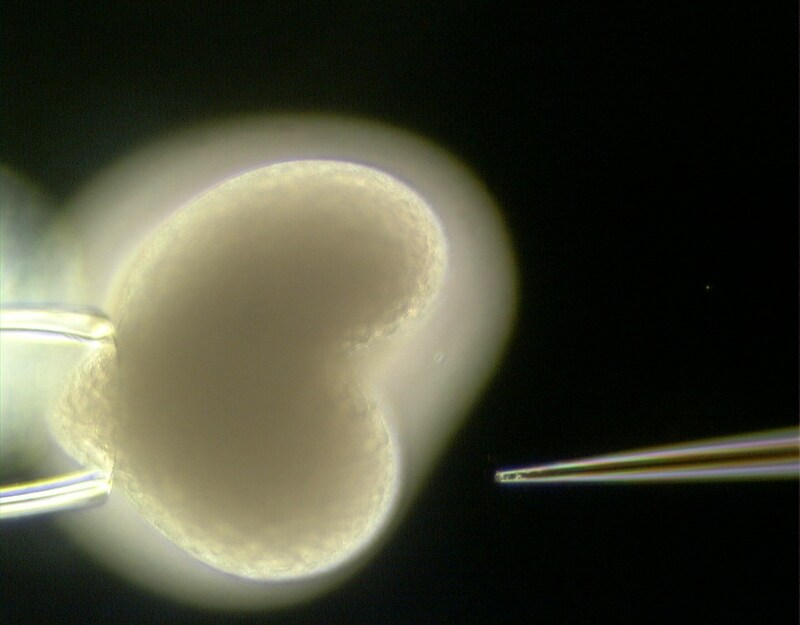 Without these stem cells, the animals could not reproduce any more. Due to its immortality, Hydra has been the subject of many studies regarding ageing processes for several years. When people get older, more and more of their stem cells lose the ability to proliferate and thus to form new cells. Ageing tissue cannot regenerate any more, which is why for example muscles decline. Elderly people tend to feel weaker because their heart muscles are affected by this ageing process as well. If it were possible to influence these ageing processes, humans could feel physically better for much longer. 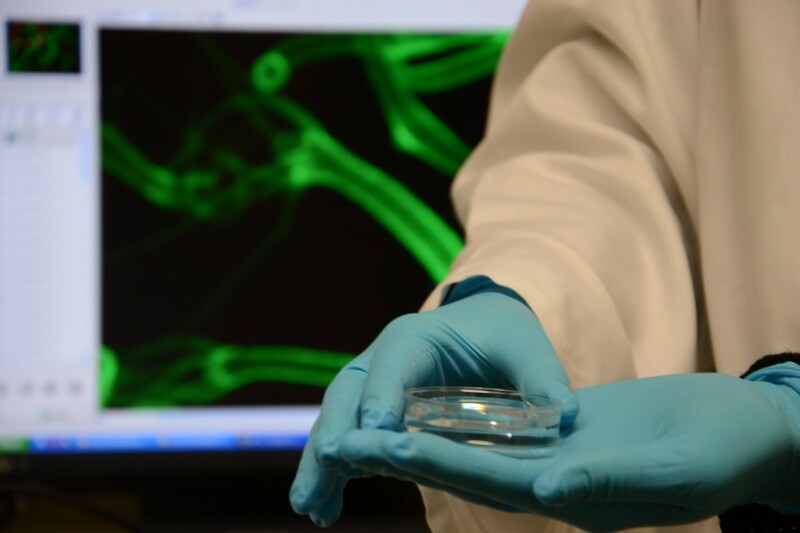 Studying animal tissue such as those of Hydra – an animal full of active stem cells during all its life – may deliver valuable insight into stem cell ageing as such. „Surprisingly, our search for the gene that causes Hydra to be immortal led us to the so-called FoxO gene“, says Anna-Marei Böhm, PhD student and first author of the study. The FoxO gene exists in all animals and humans and has been known for years. However, until now it was not known why human stem cells become fewer and inactive with increasing age, which biochemical mechanisms are involved and if FoxO played a role in ageing. In order to find the gene, the research group isolated Hydra’s stem cells and then screened all of their genes. The Kiel research team examined FoxO in several genetically modified polyps: Hydra with normal FoxO, with inactive FoxO and with enhanced FoxO. The scientists were able to show that animals without FoxO possess significantly fewer stem cells. Interestingly, the immune system in animals with inactive FoxO also changes drastically. „Drastic changes of the immune system similar to those observed in Hydra are also known from elderly humans“, explains Philip Rosenstiel of the Institute of Clinical Molecular Biology at UKSH, whose research group contributed to the study. „Our research group demonstrated for the first time that there is a direct link between the FoxO gene and ageing“, says Thomas Bosch from the Zoological Institute of Kiel University, who led the Hydra study. Bosch continues: „ FoxO has been found to be particularly active in centenarians – people older than one hundred years – which is why we believe that FoxO plays a key role in ageing – not only in Hydra but also in humans“. However, the hypothesis cannot be verified on humans, as this would require a genetic manipulation of humans. Bosch stresses however that the current results are still a big step forward in explaining how humans age. Therefore the next step must be to study how the longevity gene FoxO works in Hydra, and how environmental factors influence FoxO activity. Scientifically, the study has two major conclusions: On the one hand it confirms that the FoxO gene plays a decisive role in the maintenance of stem cells. It thus determines the life span of animals – from cnidarians to humans. On the other hand, the study shows that ageing and longevity of organisms really depend on two factors: the maintenance of stem cells and the maintenance of a functioning immune system. Caption: With Hydra, the longevity gene was probed. The animal is about 1 cm in size. 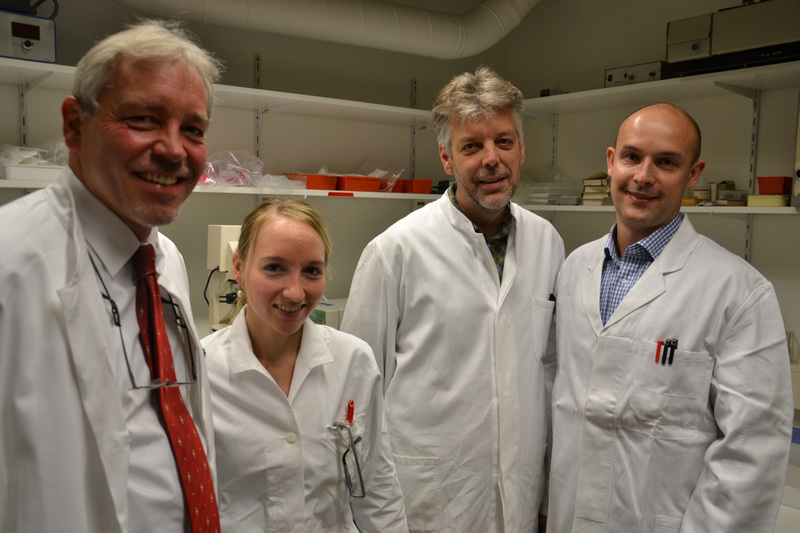 Caption: Professor Thomas Bosch, head of the Hydra-Study and his team: Anna Marei Böhm, Jörg Wittlieb and Dr. Konstantin Khalturin. 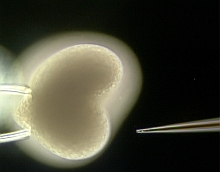 Caption: A gene sequence is injected into an embryo of Hydra. 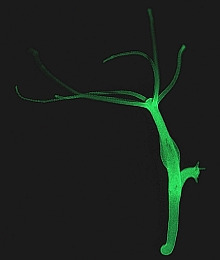 Caption: Genetically modified polyps of Hydra appear to be green when looked at under a fluorescence light microscope.